With the boot stripped back to the shell the car had lost some weight, but it wasn't looking too hot! 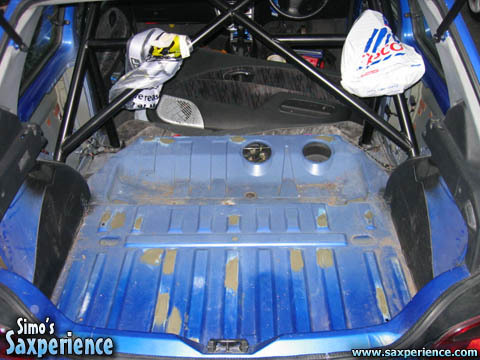 Citroen had tried to save a few pence when building the Saxo and hadn't bothered to paint the boot floor properly. How annoying! 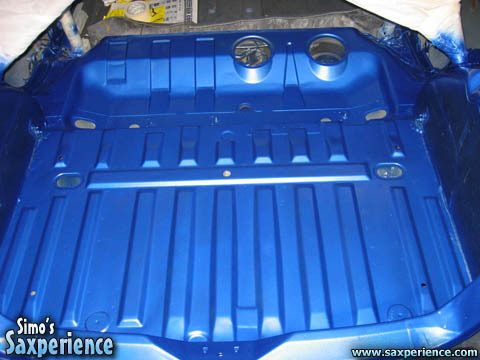 Always one to try to do a job properly I decided to respray the boot floor and rear interior the same shade of blue as the outside. Before having the custom paint mixed, I filled some dents in the floor and rubbed everywhere smooth. It turned out to be quite a big job, but I think the finished look made the hard work worthwhile! Just three days before the FCS track day, disaster struck! When accelerating hard in first or second gear, a loud grinding noise and judder could be heard/felt... it was identical to the problems I had in September 2004 when the crown wheel came away from the diff'! I couldn't risk taking the car on the track like this, so I had to find a replacement gearbox... and quick! I took a day off work and went touring around scrap yards looking for a VTS gearbox. Nobody had one and the scrap yards that did, turned out to be 1.1L or 1.4L gearboxes; apparently the gearboxes are 'all the same'... yeah, ok fella! With time rapidly dissapearing, I decided to buy a 1.1L gearbox. It was as cheap as chips (£40) and was available off the shelf from a friendly Citroen breaker down in Stoke. 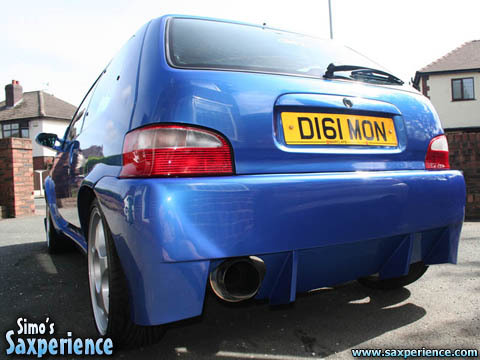 I went to pick the gearbox up and myself and Danny Speight fitted it the night before the trackday! Thanks also to Phil and to Raf for letting us use your garage and gear... although you did charge handsomely for the privelage! The box fitted a treat after swapping a few sensors and connectors over and the horrible judder/grinding noise had gone! The official gearbox replacement count now stands at three!